Babbage and a working Difference Engine built at the Science Museum, London. 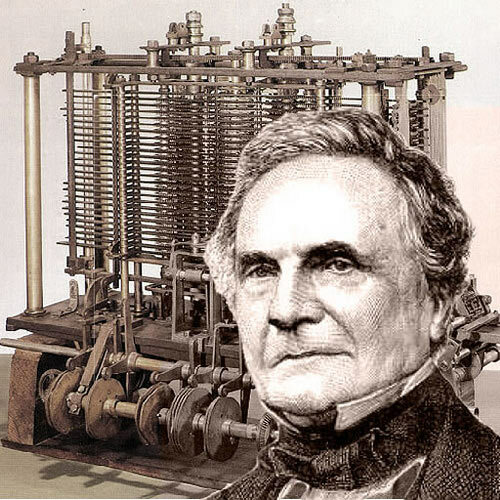 Charles Babbage was an English mathematician and inventor who served as Lucasian Professor of Mathematics at Cambridge (1828–1839) and became the most important figure in the prehistory of computers. Babbage noted that astronomical and other mathematical tables of the period were riddled with errors because all the calculations had to be done by hand. This gave him the idea of building a machine that would do the tedious work of computation more accurately, faster, and without ever getting tired. Born at Totnes, Devonshire, Babbage entered Trinity College, Cambridge, in 1811, but graduated from Peterhouse in 1814. Two years later he was elected a Fellow of the Royal Society. The idea of building a calculating machine first occurred to him in 1812. In 1822, Babbage wrote a letter to one of the top British scientists of the day, Humphry Davy, in which he talked about the design of an automatic calculator. Shortly after, he was given a grant by the British Government to build this device – an elaborate symphony of rods and interlocking gear teeth – which Babbage called the Difference Engine. Construction started but never finished. Despite heroic efforts to construct a working model, the critical tolerances were beyond what engineers could provide in the first half of the 18th century (though the gear-making skills learned gave Britain an edge in precision machinery for several decades and even contributed to the qualitative superiority of the British navy in World War I). The government had spent £17,000, and Babbage £6,000 his own money, on the project, when Babbage set his sights on something even more ambitious. He grasped that the basic mechanisms of the Difference Engine could be generalized to an all-purpose calculating machine, programmable by a punched-card mechanism like that of a Jacquard loom. This vastly more powerful machine was called the Analytical Engine and would have been the world's first true computer. But it never got off the ground. "He was ill-judged enough," wrote the secretary of the Royal Astronomical Society, "to press the consideration of this new machine upon the members of Government, who were already sick of the old one." Prime Minister Robert Peel was less than enthusiastic: "I would like a little previous consideration before I move in a thin house of country gentlemen a large vote for the creation of a wooden man to calculate tables from the formula x2 + x + 41." The government's eventual withdrawal of support for his schemes left Babbage a disappointed and embittered man. However, his ideas survived and proved to be the forerunner of modern computers. Parts of his uncompleted mechanisms are on display in the London Science Museum. In 1991, working from Babbage's original plans, a Difference Engine was completed – and functioned perfectly. Babbage played a part, along with John Herschel and G. Peacock, in introducing the Leibnizian (see Leibniz) "d" notation for calculus into British mathematical use in place of the less flexible "dot" notation devised by Newton. Among Babbage's many less famous accomplishments was his cracking of the Vigenère Cipher, a discovery that helped English military campaigns but wasn't published for several years by which time the credit had gone instead to Friedrich Kasiski, who broke the code some years after Babbage. In his later years Babbage became fiercely and eccentrically hostile to organ-grinders, in spite of whom he survived until October 18, 1871. 1. Swade, Doron. The Difference Engine: Charles Babbage and the Quest to Build the First Computer. New York: Viking, 2000.